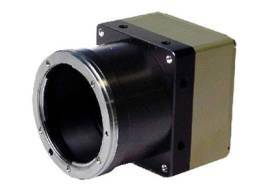 We offer high-speed, high-performance line cameras with resolutions of: 512, 1024, 2048, 4096,6144, 8192 and 16,384 pixels. Monochrome, mono-line color and multi-line color versions are available. These are true 12 bit cameras with additional settings for 10 and 8 bits. Cameras are made for a wide range of industrial applications and feature data rates up to 1.60 Giga-bits per second, and line rates up to 200 Klines per second at 11,000 pixel resolution. Other features include: CameraLink®, or CoaXPress® interface, built-in anti-blooming exposure control functions, no lag effect sensor technology, multi-camera synchronization, flat-field correction and contrast expansion. The system designer can utilize numerous programmable settings to implement the camera in many configurations: integration time, gain, offset, trigger mode, calibration (FFC and contrast expansion), and output format. Two tap four-tap, and eight tap cameras provide a full range of speeds. Our cameras are typically embedded as integrated parts in our customers' products. Our cameras are compatible with most standard CameraLink® frame grabbers. Common application is camera industrial inspection, a machine vision camera, or for high speed postal sorting / web inspection. 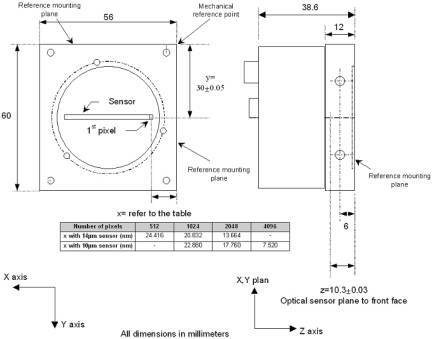 Our exacting mechanical tolerances regarding sensor positioning, with reference to the external mechanical camera mount provisions, are a key feature which is often under-utilized by the designer. 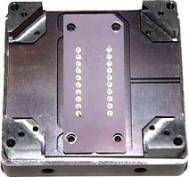 We accomplish this by using a special ceramic package, thereby mounting the center of the first pixel on the die to the tolerances of this package. By taking advantage of this precision you can simplify your system calibration and reduce your manufacturing time by eliminating processes normally needed for camera alignment. 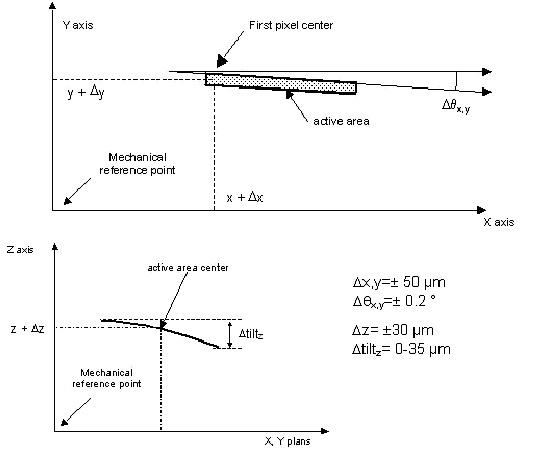 Your mounting design need not be over complicated in an effort to compensate for a camera using lower mechanical precision. All sides of the cameras' front are usable for precision mounting, since the sensor in the ceramic package is referenced to these mounting holes. Our mono-line color line camera is a low cost easy to implement color line scan solution. This high performance camera has a 12-bit output with a data rate of 60 mega pixels per second (setting available for 8 or 10-bit output). 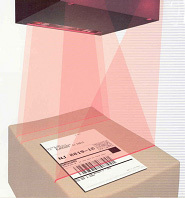 Other comparable solutions require either 3 separate sensors and a prism, which is costly, or 3 lines of sensors on a single chip, which causes problems with pixel and line registration. The mono line solution only needs color space correction and color reconstruction, which is easier and more cost effective. Pixel pitch is 10µm, and width is 7µm. Pixel height depends on color: Red is 20µm, Green is 12.6µm and Blue is 11.7µm. These are high performance 12-bit output cameras with data rates of 60 mega pixels per second (settings available for 8 or 10-bit output). These use high sensitivity and signal to noise sensors, which require less light than other line scan cameras at high speed. The "No Lag" sensor technology increases your contrast, even at high line rates. Recognizing transitions in 1 or 2 pixels is possible which in many cases replaces the need for expensive TDI cameras. Available in resolutions from 512 to 4k and two pixels sizes*, our camera is one of the smallest and lightest available today. Your power supply needs are simplified since this camera only needs a single input voltage and accepts an enhanced input range of 12 to 24VDC. With 100% aperture, the camera is more sensitive yet has incorporated anti-blooming for 150 times saturation in extreme lighting environments. The camera is available with embedded flat-field correction (FFC) algorithms and contrast expansion. Gain and offset are fully programmable for each output channel from 0 dB to 40 dB in steps of 0.05 dB. The camera can be set in free fun mode or can use an external trigger and can be configured for multi camera synchronization. Common application is camera industrial inspection, a machine vision camera, document scanning, web inspection, semiconductor inspection or for high speed postal sorting. Camera mounts are available for all standard lens options. These are high performance, and high speed 10-bit output cameras with data rates of 160 mega pixels per second (setting available for 8-bit output). The "No Lag" sensor technology increases your contrast, even at high line rates. Recognizing transitions in 1 or 2 pixels is possible which in many cases replaces the need for expensive TDI CCD cameras. Available in resolutions of 2048, 6144 and 8192 pixels, our camera is one of the smallest and lightest available today. Your power supply needs are simplified since this camera only needs a single input voltage and accepts an enhanced input range of 12 to 24VDC. With 100% aperture, the camera is more sensitive yet has incorporated anti-blooming for 100 times saturation in extreme lighting environments. 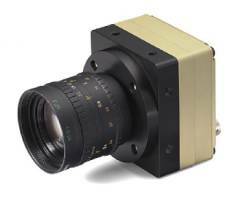 The camera is available with embedded flat-field correction (FFC) algorithms and contrast expansion. Gain and offset are fully programmable for each output channel from 0 dB to 30 dB by steps of 0.035 dB. Common application is camera industrial inspection, a machine vision camera, document scanning, web inspection, semiconductor inspection or for high speed postal sorting. This line scan camera can be set in free fun mode or can use an external trigger and can be configured for multi camera synchronization. 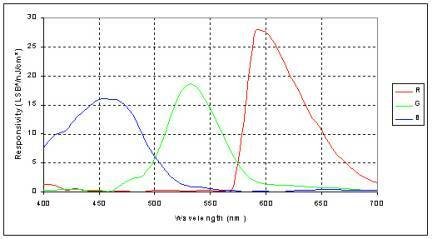 Note these important radiometric performances showing high sensitivity and signal to noise ratio. Lens mounting for 2k to 8k resolution cameras.